The Onam Festival is the biggest festival of the year in India's southern state of Kerala. Much of the state's culture is showcased during Onam festivities. These Kerala Onam pictures reveal the color and splendor of the celebrations. Celebrations start with the Thripunithura Athachamayam ​festival on Atham (10 days before Onam) in Thripunithura, near Ernakulam in Kochi. In earlier times, the festival was celebrated in commemoration of the King of Kochi. He marched from Tripunithura to the Vamanamoorthy Temple in Thrikkakara (also known as Thrikkakara Temple). The era of royalty had ended but the festival is still celebrated with all its glory to mark the beginning of Onam. 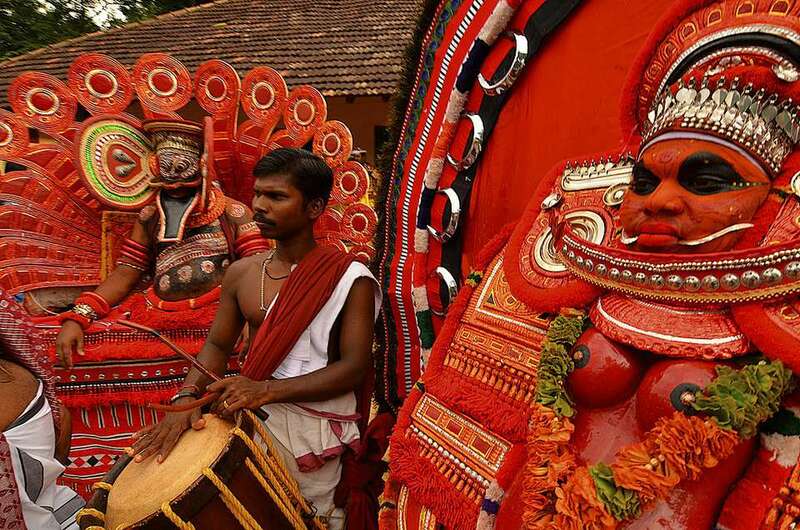 It includes a street parade with floats, musicians, and various traditional Kerala art forms such as theyyam. Enthusiastic drummers play during Onam celebrations. Traditional drumming is an integral part of festivals in Kerala. Flowers are for sale at the street market on the eve of the Onam festival. These flowers will be used to make pookalams (floral carpets). Decorative pookalams are a highlight of Onam festival celebrations and the most prominent ritual. The creating of pookalams traditionally starts on Atham, and a new ring of flowers is added each day up until the main day of Onam. Contests for making the best pookalams are also held across Kerala during the festival. The Onam pookalams are placed at the entrance to homes to welcome mythical Onam King Mahabali and seek his blessings for prosperity. Lamps are also lit to invite King Mahabali into homes. A lamp will typically be placed at the center of every pookalam. Thiruvathira Kali is a popular folk dance performed by women during Onam. They clap and coordinate their hand movements in unison, while gracefully moving in circles and singing. According to legend, Thiruvathira Kali brought the deity of love, Kamadeva, back to life after Lord Shiva reduced him to ashes. Others say Thiruvathira Kali commemorates Lord Shiva taking Goddess Parvati as his wife. Swings, decorated in flowers, are also an integral part of the Onam festival, particularly in rural areas. Kerala Tourism also sets up hundreds of swings around Trivandrum for the public to use. The play on swings is known as oonjalattam. Onasadya is the grand feast that's served during Onam celebrations in Kerala. It's prepared on the main day of Onam and dished up on a banana leaf. Extremely elaborate in nature, it consists of numerous types of vegetarian dishes. A typical Onasadya feast has 11 to 13 different dishes, all consumed in a particular order. The most famous snake boat race that's held during Onam celebrations is the Aranmula carnival, which occurs along the Pampa River. Another tradition during Onam is for men to dress up as tigers. The ancient tradition of Pulikali, which means "tiger play" or "tiger dance" is a curious practice indeed. The long dressing-up process requires men to have their bodies shaved before the first coat of paint is applied. The second coat is applied after a couple of hours, and then the men dance like a tiger. During the Onam festival, masked artists go from house to house performing the Kummatti folk dance to the beat of drums. They also dance on the streets in various districts. Their costumes are made from grass and wooden masks of popular gods such as Krishna, Hanuman, and Ganesh. Shinkari Melam is a classical music performance using traditional instruments in Kerala. Musicians perform with cymbals and the ​chenda, which is a cylindrical percussion instrument that's used widely in south Indian states. The chenda is used as an accompaniment for religious art forms and dance rituals in Kerala, including Pulikalli tiger play.